UMCM would like to congratulate everyone who took part in or helped to organise the Christmas concert last night. It was a wonderful evening with a full and lively audience and we all thoroughly enjoyed the evening. We will post more here during the week including pictures. 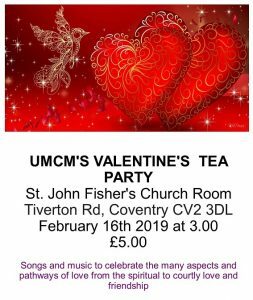 UMCM’s next concert is a Christmas Carol concert on Saturday December 8th at Earlsdon Park Village, Albany Rd, Coventry CV5 6JQ, starting at 7pm. Expect Christmas carols and songs famous and obscure, fresh faces and old favourites, and lots of fun. Dress festively if you like and warm up your voices! A cabaret style concert with hot food during the interval was shared between the musicians of UMCM and the group Between Us. The event was thoroughly enjoyed by the performers and by the excellent turnout of people watching and indeed singing along. Thank you to our hosts Sacred Heart Church, Harefield Road, Coventry. Celebration Concert – tickets available! Tickets for the celebration concert on 23 June are now available on EventBrite. Reminder: We’re celebrating the return of the fully restored 1878 Bechstein piano to St John the Baptist with a piano recital by Russian concert pianist Varvara Maggs. Click below to order your tickets to this fantastic event!